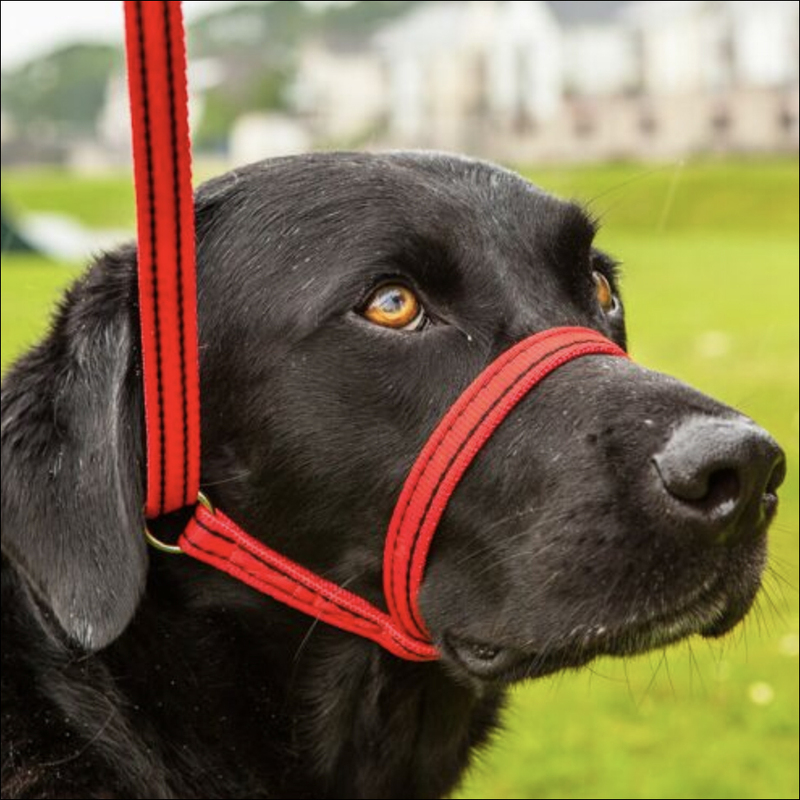 Standing out from the range of different Gencon products is the All-in-1 Clip-to-collar lead – the simplest and most effective solution to stop a dog pulling on the lead. In fact, it’s so far ahead of all the other Gencon products that it’s the only Gencon item we stock. If you’ve ever experienced how exhausting and embarrassing it can be when your dog is pulling on the lead, or lunging at other dogs and people, you’ll be pleased to discover that Gencon has a solution. The Gencon All-in-1 Clip-to-collar leads are made from soft yet durable webbing fabric and are specifically designed not to pull up into your dog’s eyes or uncomfortably turn their head, making them the perfect lead training accessories for grown dogs and puppy walking. 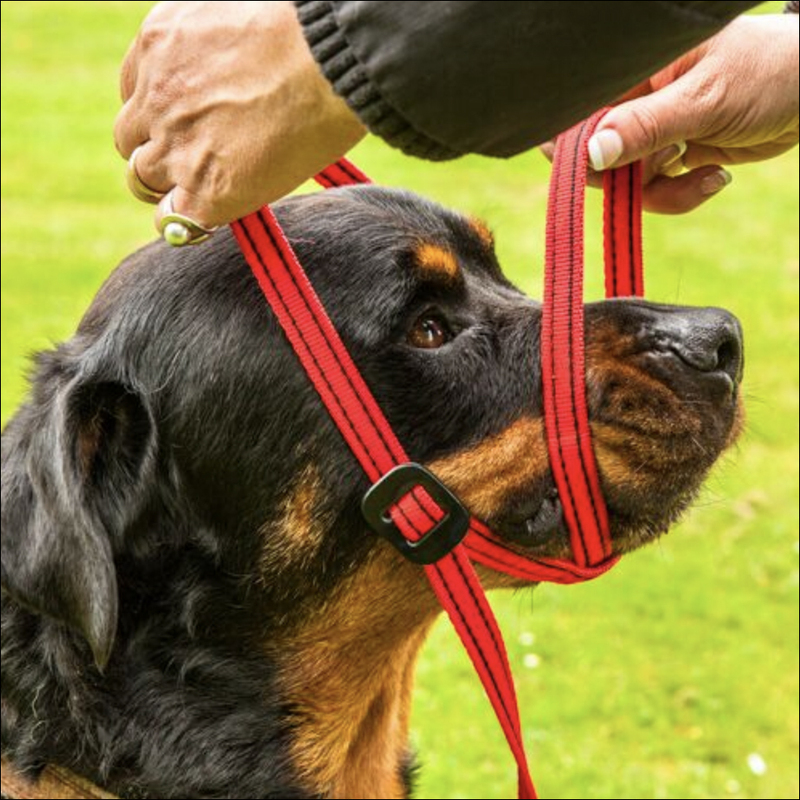 Each Gencon All-in-1 Clip-to-collar lead consists of one piece of lead, towards one end are formed two simple loops (often referred to as a ‘figure of 8’) that apply gentle pressure when your dog pulls, the lead gently but effectively stopping your dog pulling forwards. Only gentle pressure is needed; there is no need to jerk. Make sure the Gencon is fitted correctly and it is slackening when the pressure is taken off the lead. 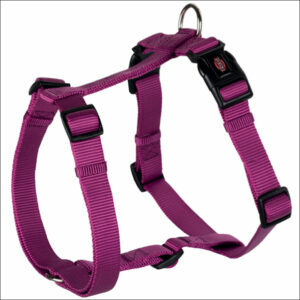 The additional feature of the top-of-the-range Clip-to-collar leads is that the ‘handle’ end of the lead terminates in a clip fastening. Depending on the behaviour of your dog you can either clip this end of the lead to your dog’s collar, giving you extra control and reassurance that an excited dog can’t slip it’s lead, or formed into a conventional handle. Most people walk their dogs on their left. The standard configuration of the lead is ‘left-handed’, so the lead, held in the right hand, crosses in front of the owner’s body to the head of the dog on the owner’s left. 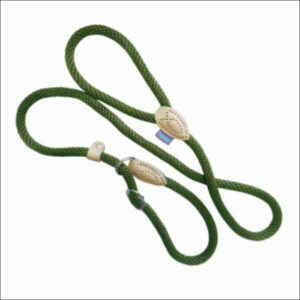 Alternatively, leads with a ‘right-handed’ configuration can be ordered to suit particular requirements. 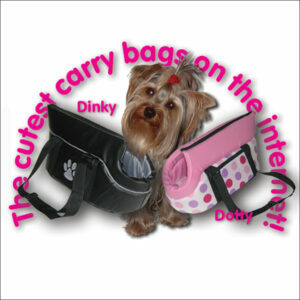 Available in a wide range of classic and modern colour ways, one size of Gencon* fits all breeds. *Gencon – the name is an an abbreviation of ‘Gen(tle) Con(trol). Sweet! Unless your dog has previous experience of >anything< around his/her muzzle, he/she is probably not going to want anything around his/her muzzle. As you should expect resistance – particularly in the early days, but with every expectation of reducing over time – start off with the Gencon in a nice, quiet, environment with the only distraction being a handful of treats. In our experience spaniels create the most fuss, labradors the least. Lay the Gencon out and you’ll see that it’s a long length of webbing ending at one end with a fastener and at the other with two loops. First of all, slide the black plastic clip along the webbing until it’s out of your way. Now hold the two loops in the shape of an ‘8’. 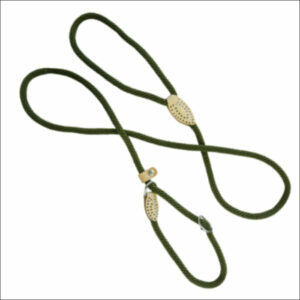 Put your dog’s head through the loop of the ‘8’ closest to the length of lead and let it hang loosely around your dog’s neck. In the middle of the ‘8’ the webbing crosses over itself: this cross-over goes under your dog’s chin. 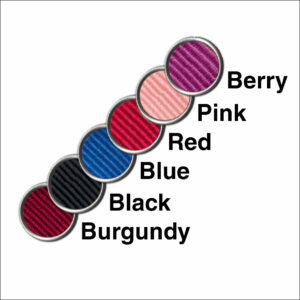 You’ll notice that the cross-over isn’t stitched as a fixed point; it is important that the webbing can slide past itself, enabling the length of webbing which will be around your dog’s muzzle to tighten and loosen. Slip the other loop of the ‘8’ around your dog’s muzzle. It’s at around this point that the photo alongside was taken. 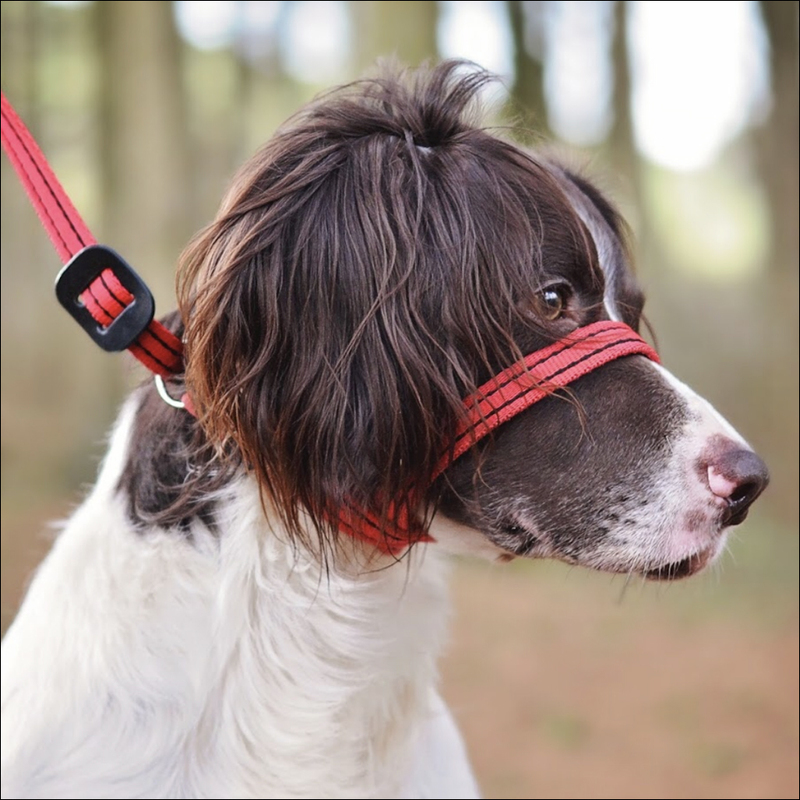 Tighten everything until it’s snug on your dog’s head, positioning the black plastic clip sufficiently tightly – but not overly-tightly – to ensure that your dog isn’t able to ‘paw’ the harness off his nose (spaniels are the worst breed for trying that!). The black plastic clip should be on either the left-hand side or the right-hand side of your dog’s neck, depending on which version you buy. Now just check that the lead isn’t interfering with your dog’s eyes, and that it won’t interfere when the dog pulls and it tightens around the muzzle. Adjust the fit until your confident there will be no interference. There are small differences between the left- and right-hand versions of the Gencon, but you can use the lead on the ‘wrong’ side – it will still work effectively. Finally, clip the fastener either to your dog’s collar – creating two points of attachment, giving you a higher level of control which is particularly useful for hyper-active dogs, at least until regular usage of the Gencon improves their behaviour – or back onto the metal loop on the lead to form a conventional handle.